For all the aubergine (eggplant) fans out there, if you like my aubergine recipes here is another one for you. The recipe is something I put together what I can find in my fridge and overload of basil in the garden. It's Thai flavour combining some of my favourite ingredients together. It's not pretty but very yummy. If you do try hope you enjoy it as much as I did. Heat oil in wok till hot, add garlic stir till fragrant. Add pork stir fry till pork is getting brown and any liquid is reducing. Add chilli paste, fish sauce and sugar. Stir for a little while. Add aubergine, stir fry at medium - medium low heat for about 15 - 18 minutes without any water. No need to stir continuously just stir every other minute briefly to ensure aubergine is evenly cooked and nothing is sticking to the wok. Keep doing this till aubergine has softened to you liking. I like it very soft, you can have it a bit more solid if you like. Have a taste see if you need any more fish sauce, chilli paste or sugar. When you are happy, stir in the basil and some lime juice. That is it. Simple isn't it. Nice looking aubergines dish Sunflower, I going to put that on my list for when I get back! This is going to be perfect. I am planning to make a healthy dinner for my kids and I think this Spicy aubergine with basil is perfect. I am sure that they will love this. This looks utterly delicious! 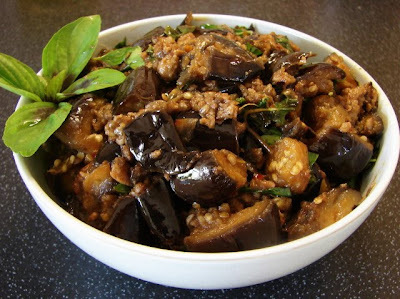 What a great idea to cook the classic Thai combo of nam prik pao and basil with aubergines! Thank you all for your comments. This is one of those recipes I threw together without plan turned out very good.